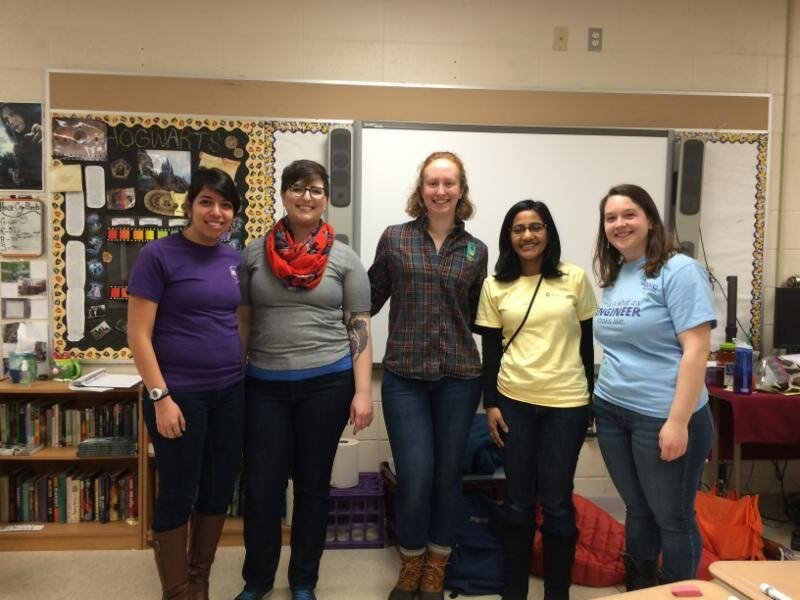 SWE Boston volunteers (from left to right): Kristen Warren, Sara Nadeau, Kate Roosa, Tulika Hainsworth, and Ellie Sanford. On Saturday, April 1, 2017, 9am-4pm Girl Scouts of Eastern Massachusetts hosted a Sampler Day at Qualters Middle School in Mansfield. This event provides Girl Scouts of all ages with an overview of different badges they can pursue. SWE Boston facilitated 5 workshop sessions throughout the day geared towards science. Home Scientist was a Brownie level workshop where girls blew up balloons using baking soda and vinegar, as well as made their own "gak" material using glue and liquid starch. Product Designer was a Junior level workshop where the girls invented their own products to solve a real-life problem. Construction Challenge was a Cadette/Senior/Ambassador level workshop where girls built a vehicle to protect their egg when it was dropped from increasing heights, using craft materials such as bubble wrap and plastic straws.